Lindz and I are now living in Burlington and I’m still working at Brock University in St. Catharines. This means that my drive has gone from 20KM round trip each day (with loads of weekend KMs) to a 150KM round trip each day (with loads of weekend KMs). That’s a big kick in mother natures pants and about 45L of gas a week and all of that gas leaves my tailpipe in the form a carbon left throughout the Niagara region. 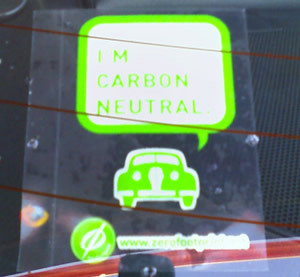 To correct this I’ve bought a carbon offset for our car from Zerofootprint. What carbon offsets are intended to do are provide a way to invest in things that remove carbon from the environment: planting trees in urban and rural areas, investing in reduction and research. I choose Zerofootprint because they are Toronto based (mainly York grads) and are the company contracted to Air Canada to handle their offset program. I’ve used Terapass from the US before for flights before, but I’m concerned about Canadian CO2, not southern Californian carbon. The science and logic behind this offset phenomenon is a little spurious, and seems like a way to pay to have your guilt hauled off; but, there is no denying that if for every ton of carbon we all emitted we balanced it by planting enough trees we’d certainly reduce the amount of CO2 in the atmosphere. It’s how the Google founders justify their corporate jet being a 757. Looks like their are rumours that NBC will remake the world’s best motoring show, and most pirated TV show, Top Gear. Here’s the Reuters wrtie-up. Reviews and creative testing automotive issues presented by an expert panel that are in fact, idiots. My buddy nick created this banner to sum-up the situation the Toronto Maple Leafs have been in for… well, too long. Make your voice heard at: www.firerichardpeddie.ca. Over the holidays you might have noticed that the Bombay Company is going out of business after a failed business plan of moving out of their prime mall locations then moving back into worse mall locations. Am I the only one left wondering if they’ll come back as the Mumbai Company? You are currently browsing the iMatt :: The Blog of Matt Clare weblog archives for January, 2008 .